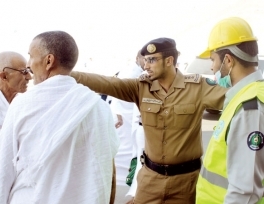 More than 60,000 security officers will be deployed in the Holy Sites during this year's Haj season to ensure the pilgrims are able to perform their rituals in peace and comfort, Maj. Gen. Osman Al-Mahraj, director of general security, has said. “These forces will be stationed in Mina, Arafat and Muzdalifah to ensure the safety of pilgrims and enable them to perform their rites with ease and comfort,” he said. The director on Sunday opened at the National Information Center a special electronic service for the screening of Haj permits. “This new advanced service will prevent permits from being forged and will save a lot of time for the passport officials as it will enable them to read the permit's data and check its authenticity quickly,” he said. Al-Mahraj said according to the system, the passport police would also be able to read a bar code on mini-buses to ascertain that all pilgrims in the vehicles have authentic Haj permits. “The passport police will no longer need to climb into the vehicle to check the Haj permit of every pilgrim individually,” he said. The director said only vehicles with 25 passengers or more will be allowed to enter Makkah and the Holy Sites. Meanwhile, Director General of Passports (Jawazat) Maj. Gen. Sulaiman Bin Abdulaziz Al-Yahya said the passport police were thoroughly trained on the use of the modern equipment to combat forgery. “The passport police have been supplied with the latest computers to process the procedures for pilgrims quickly and efficiently,” he said. Al-Yahya asked all residents, Saudis and expatriates, to obtain Haj permits before they start their pilgrimage, otherwise they will be turned back. He warned against transporting illegal expatriates to Makkah or the Holy Sites and said violators would be severely punished. Al-Yahya revealed special passport police committees were set up in Makkah and Taif to try violators on the spot. "The committees will be working around the clock to carry out their duties," he said. On the other hand, Makkah Municipality has recruited more than 23,000 employees to implement its Haj plan aimed at providing consummate services to the guests of God. Mayor Osama Al-Bar said the employees include about 14,000 cleaning workers who will be using more than a thousand pieces of cleaning equipment to keep Makkah and the Holy Sites clean during Haj. He said the municipality also has teams to monitor markets to ensure the stability of prices. “There are about 33,000 permanent shops in Makkah in addition to 2,229 temporary stalls selling food items during the Haj season,” he said. Al-Bar said 27 municipal service centers were established in the Holy Sites to provide civic services to the pilgrims.